Located a few hours east of Melbourne, the Baw Baw ranges are well known for their ski fields and high country snow gum forests. However, in the mid altitude slopes, between 400 to 1000m above sea level, they are also home to some fine remnant stands of mountain ash, mountain grey gum and shining gum. 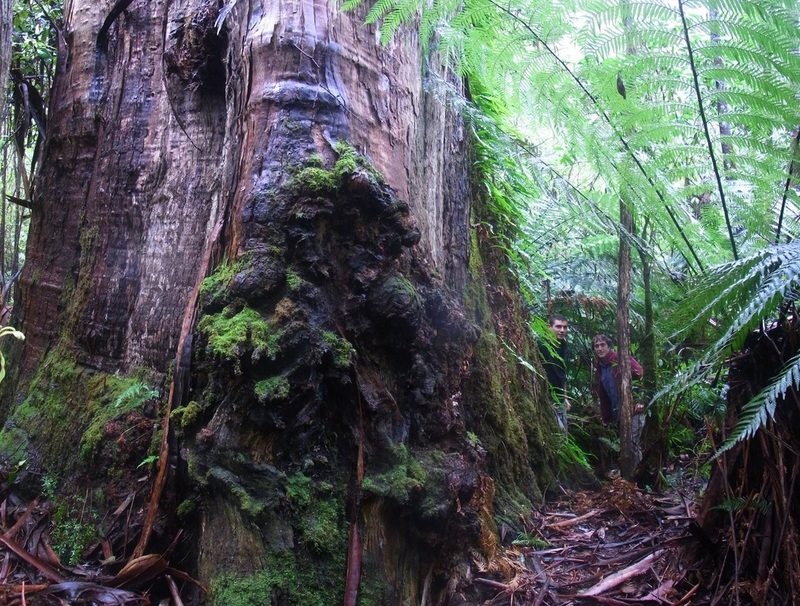 Above top, 'Old Smiley' grows near the South Cascades off the Thomson valley road - above its 12m girth base, this tree has a large, slow tapering trunk and a very full crown as can be seen in the second photo (above, lower) of Tom Greenwood climbing it. If he seems a long way out from the trunk, you are correct! This tree caused us no end of frustration when trying to set a line in it with its full crown and messy bark deposits on the branches and eventually Tom was forced to set a line well away from the trunk. compare it to the climber. 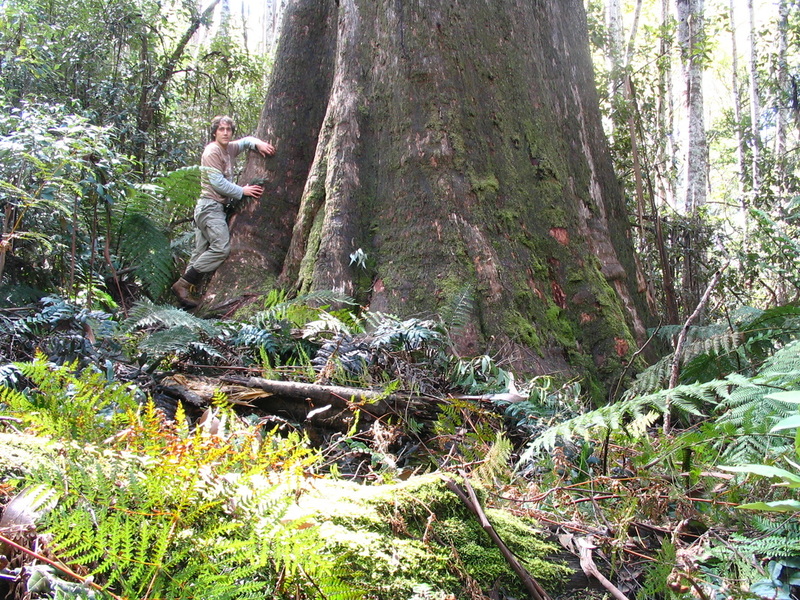 Even though its trunk is broken at 41m up, this tree is currently regarded as the largest tree known in mainland Australia with a wood volume of 244m3. Shining gum, Eucalyptus denticulata, usually grows above the mountain ash zone and below the alpine ash and snow gum zone. They can be long lived and unlike mountain ash, they commonly survive fire. 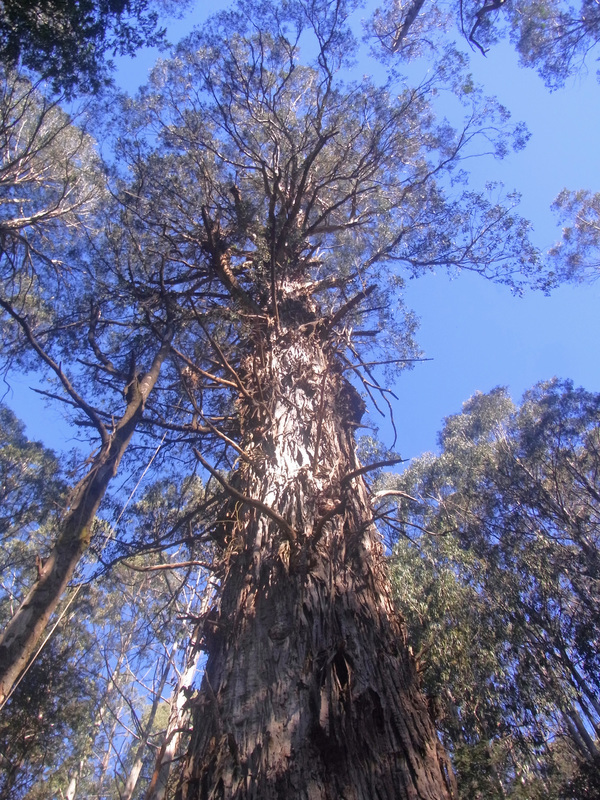 They almost rival mountain ash for size and height as well, with the tallest measured tree being over 84m tall. The Whitelaw Tree, photographed above by Darren Primm, can be visited via a signed track, accessed from the Thomson Valley road. 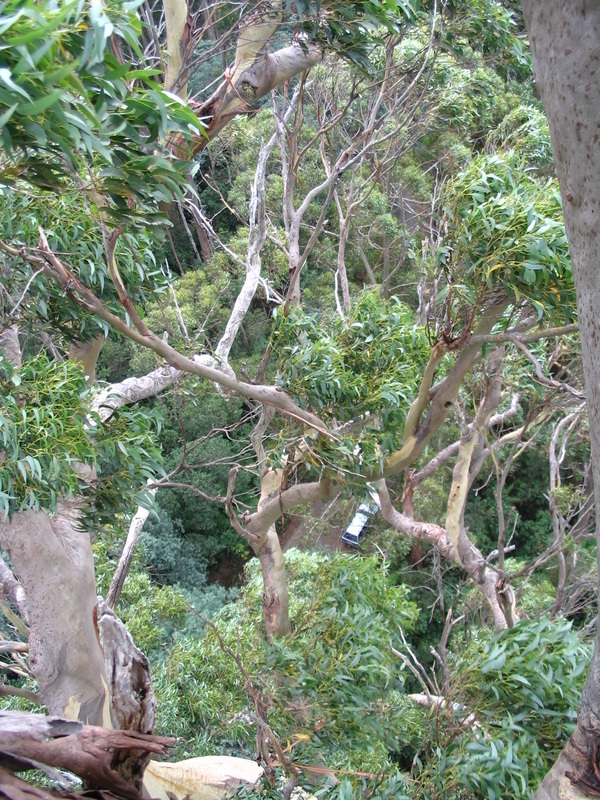 At 228m3 it is one of Victoria's largest remaining trees. 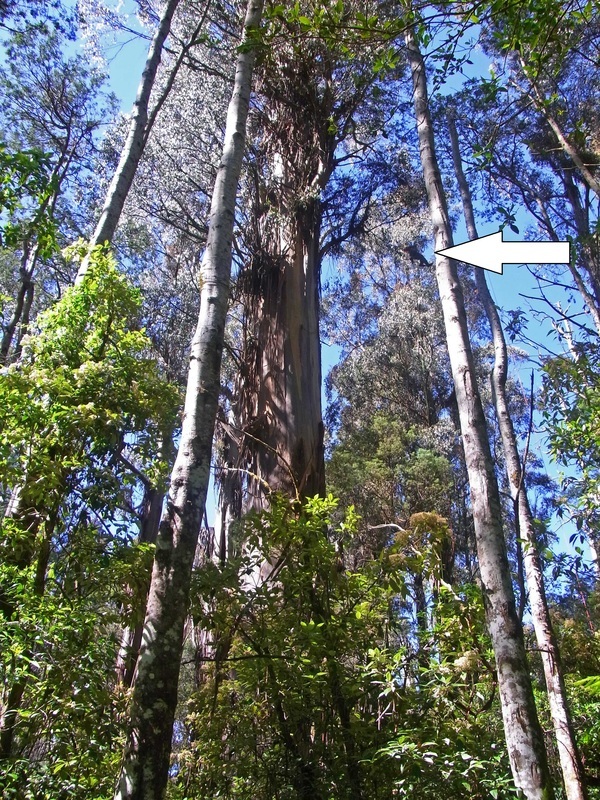 Below is the incredibly shaggy trunk of 'Hairy Maclary', another shining gum growing a few hundred metres from the Whitelaw tree - this tree is 10.7m girth and 58m tall. 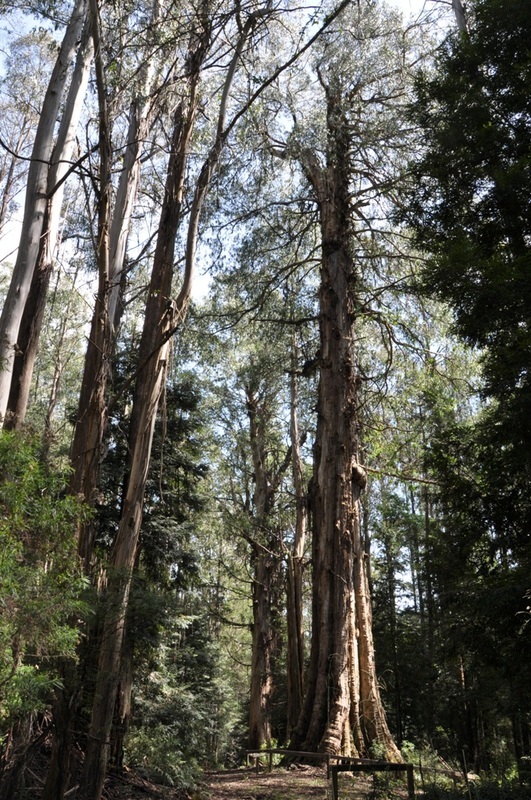 The 'Lonely Tanjil Titan', above, is a huge mountain grey gum, Eucalyptus cypellocarpa, growing amongst logging regrowth high on a ridge a few kilometres from the small locality of Tanjil Bren.